To find out your Birth Profile lucky element 八字用神 is one of the most difficult task in Bazi Reading. Many clients requested me to provide a quick method to identify Birth Profile Lucky element/s. Unless your Birth profile belongs to “Special Classification or Non-Standard Birth Charts 八字特别格局(外格/变格)” such as 真假-专旺格, 弃命-从格 etc. This birth profile lucky element table only act as a reference and applies to 75% of the people having Standard Birth Charts 八字正格. 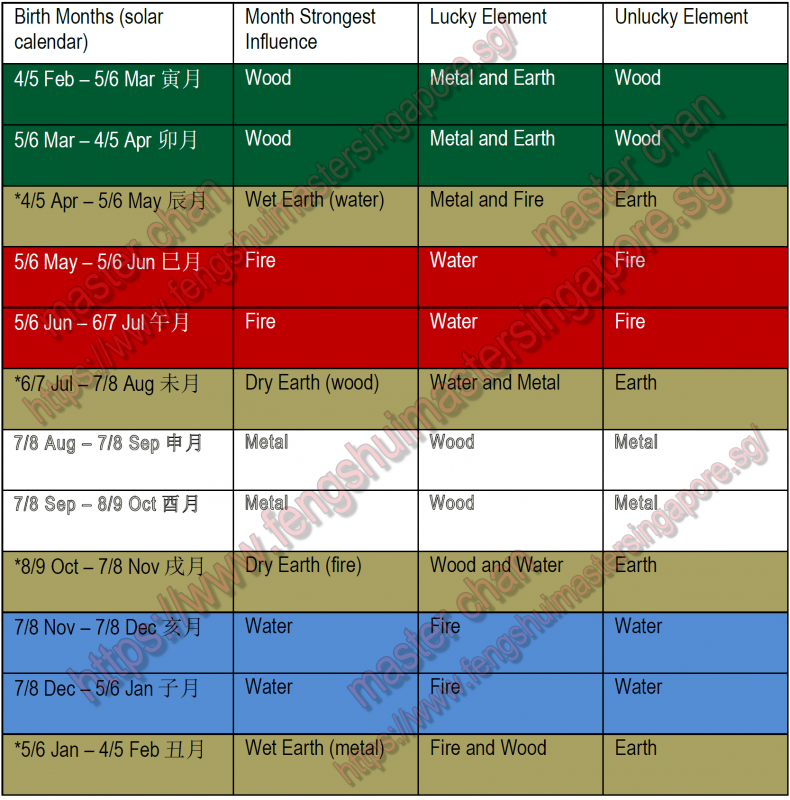 Why is it important to understand your Birth Profile Lucky or Unlucky Elements? All of our Birth Structure is IMBALANCE! Some possess certain element more than the rest. The 5 Elements refer to wood, fire, earth, metal and water 木火土金水. The imbalance of elements found in the birth chart causes disharmony which can lead to various interpretations such as poor health/career/wealth/marriage/relationships issues. Therefore the concept to understand Birth Profiling lucky or unlucky elements is to “balance” our Birth Structure to reduce frictions in our life. The Quick reference chart is based on “月令Month of Birth” which is the critical factor to determine whether you are a strong or weak “x-element” Day Master Person. With google search or mobile app it is not difficult to find out what “element” is your day master. It should be one of these 10: 甲乙 wood 丙丁fire 戊己earth 庚辛metal or 壬癸 water. Once you have identified your Day Master – element just follow the chart. Take for example you are born on 15 June, based on the chart, your unlucky element is fire. From the chart, your lucky element is “water”. Thus you can improve your career chances by getting a job that is compatible with your lucky element. At home you can consider having a “water-feature” at home. As for health concern you can take up swimming as an exercise, take “cooler” food such as ice cream/yogurt and avoid deep fried food. Due to the imbalance, individuals born during this season tend to have health issues related to respiratory such as persistent coughing, out-of-breath, sore throat and other lung-related challenges. Go through this website you will find out how to improve your luck, once you have establish your bazi lucky element. Wood element enhancement: potted plants, green colour, vegan diet, East / South East sector/direction. Fire element enhancement: lights, red, orange, purple colour, red wine, spicy food, South sector/direction. Earth element enhancement: porcelain, ceramic, brown, yellow, khaki, beef, Northeast/Southwest sector/direction. Metal element enhancement: gold, silver, platinum, white, chicken, white fridge, West/Northwest sector/direction. Water element enhancement: fish tank, black, grey, blue, fish, North sector/direction.